Ebony for the stripes down the neck. It is covered in wax right now, so it doesn’t look as good as it really is. It is jet black. I can’t wait to get to work on this one, it will be fun! 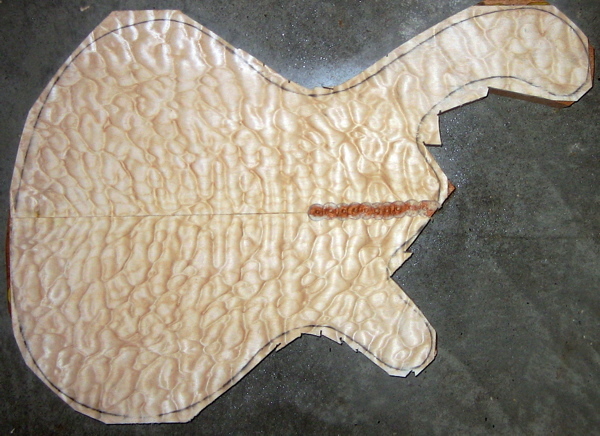 I rough cut out the templates for the neck and body to see what it will look like. The neck will be trimmed down a bit, but the body is cut to its final shape. I got a little update on the pickups so far from Searcy String Works. 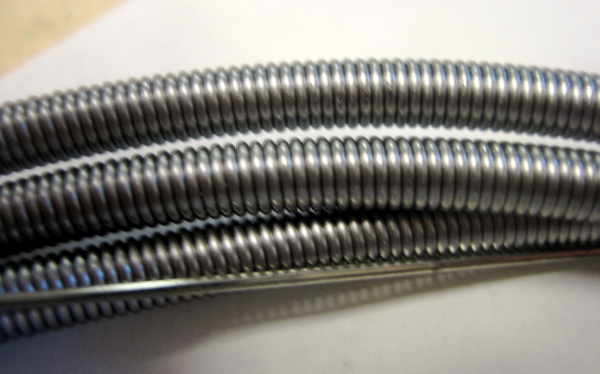 He has started winding them and is working on the Ebony pickup covers. 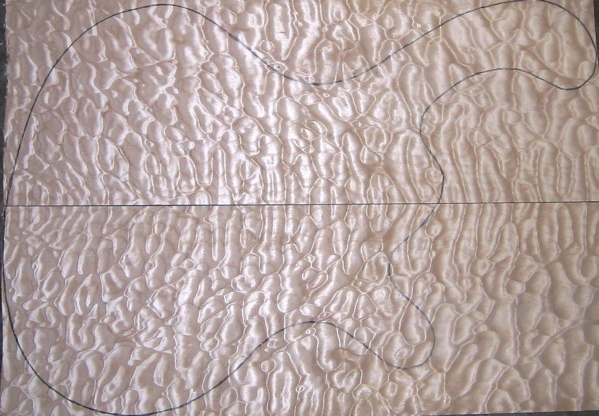 I got the Quilted Maple in the mail today and was very happy with what I had purchased. 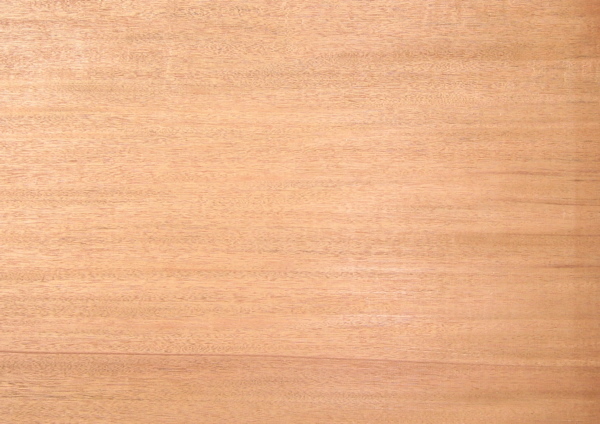 Don’t mind the glue line between the bookmatched Quilted Maple, with a little sanding it will be gone. 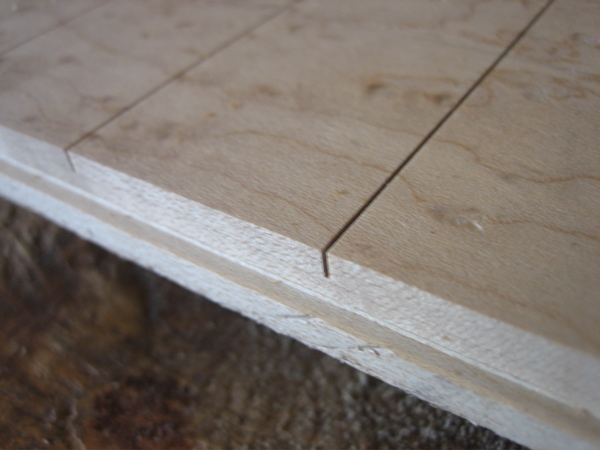 I finished cutting out the body and went ahead and rounded all the edges over with a 3/4″ bit on the router. 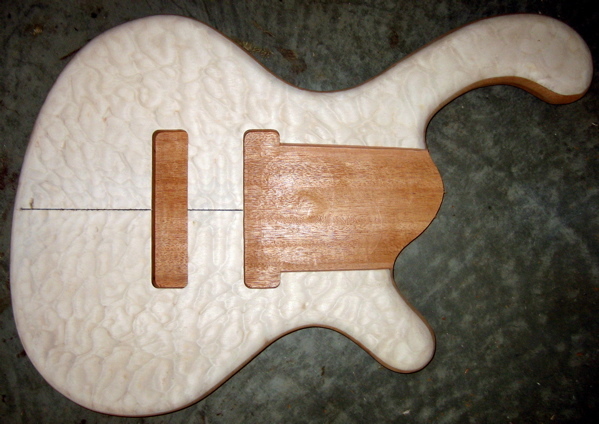 I then rough cut out the neck taper along with the neck thickness on back. 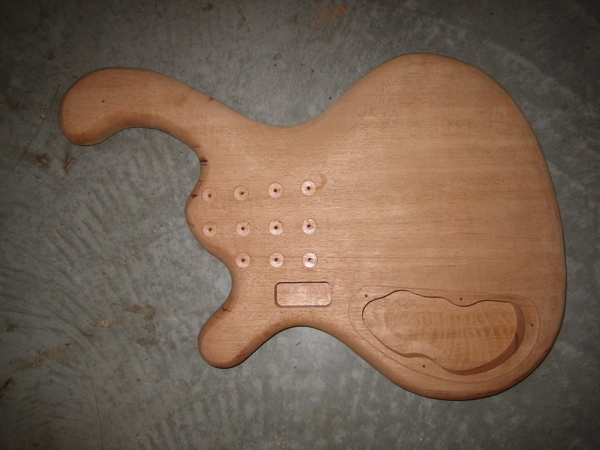 I also cut out the angle for the headstock and the headstock shape. It’s not that big next to a Stratocaster. 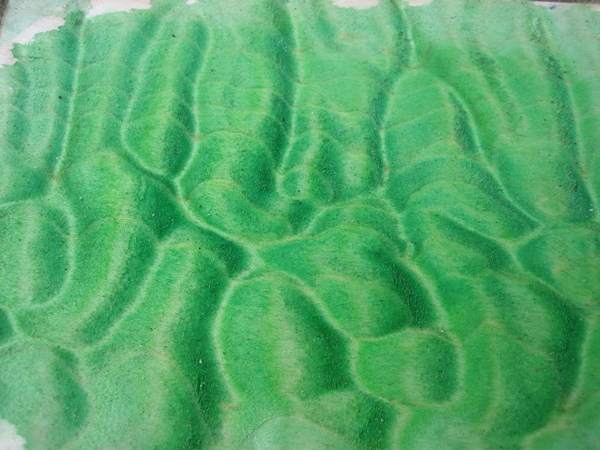 I was doing some green dye for another project and decided to try it out on the Quilted Maple. 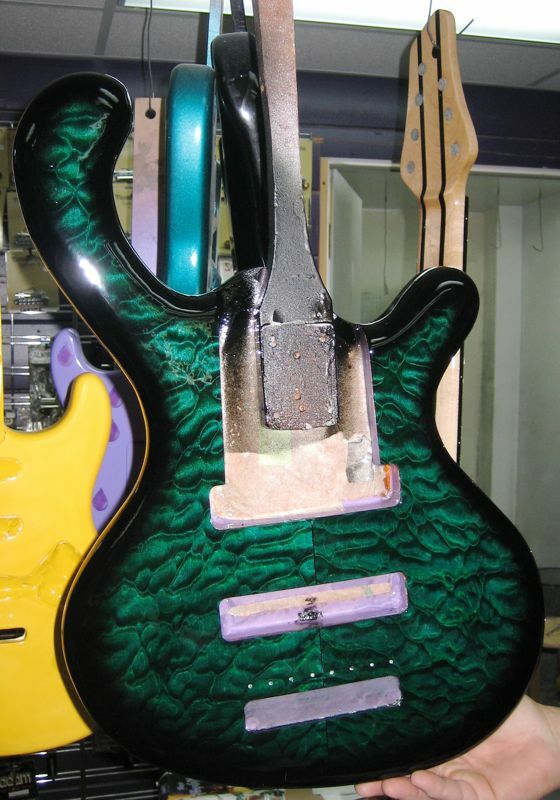 It is the same kind of dye the bass will get, but in turquiose. 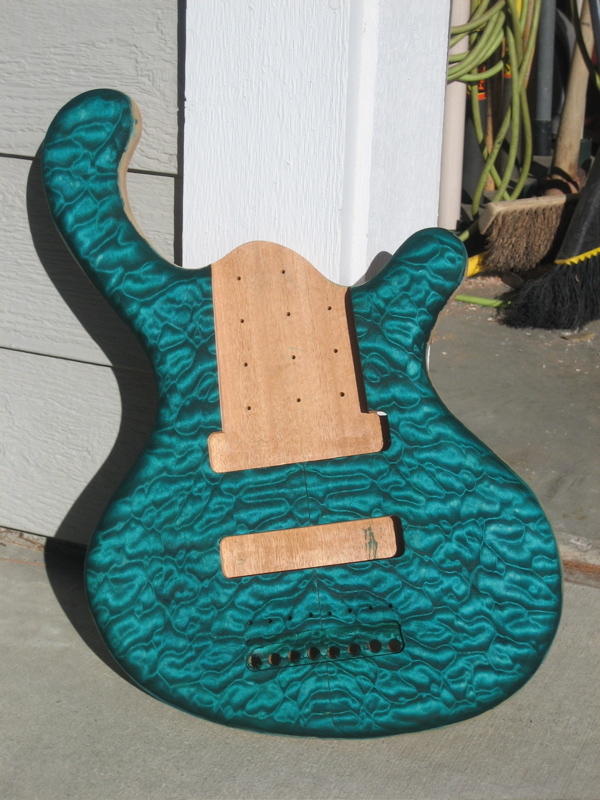 It really brings out the figure in the wood and it will really look like waves in the ocean with the other dye. Beautiful! 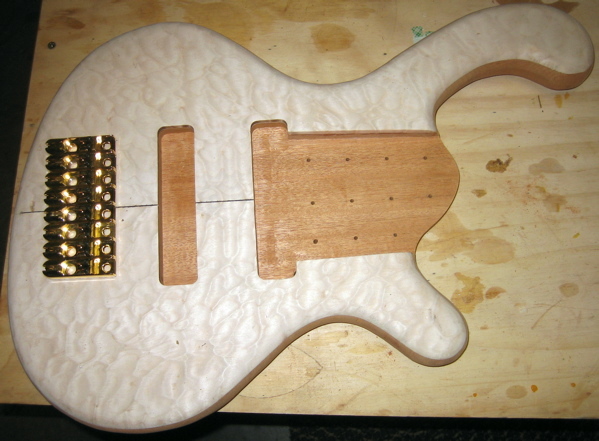 Wow, a lot of progress was made today on this bass. It won’t look that much different from here on out though. I was able to trim the neck to its final size, perfectly straight and start the shaping. I also carved the “tummy cut” on the back of the body. 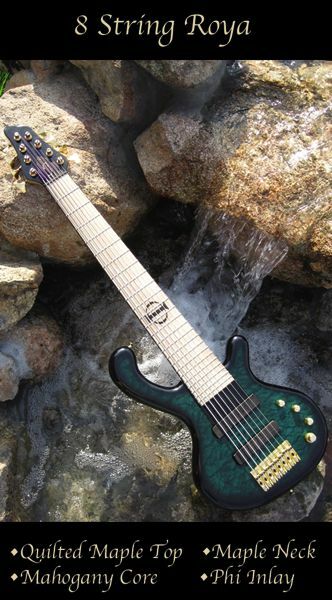 Although it is covered by the fretboard in the picture, I routed the channels for both truss rods. 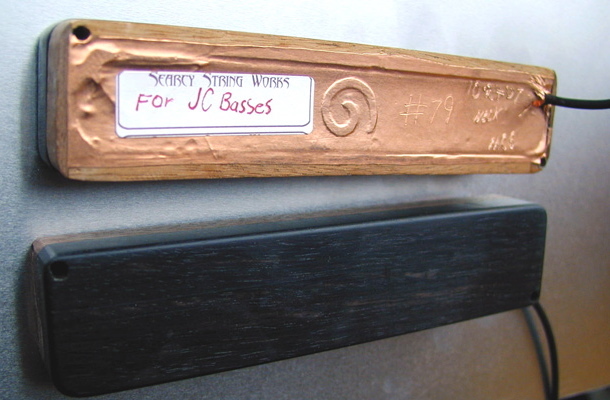 Here I made the nut and truss rod cover out of Ebony with a Maple “J” inlayed. I got an update on the pickups and they are done! They should be here on tuesday. 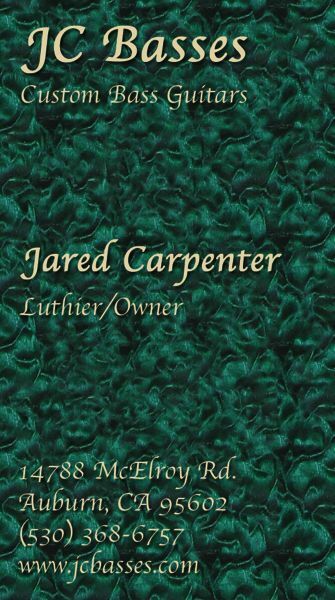 From all the pictures I can tell they look great and I look forward to using them. Thank you very much Clint Searcy of Searcy String Works. Today and yesterday went perfectly. 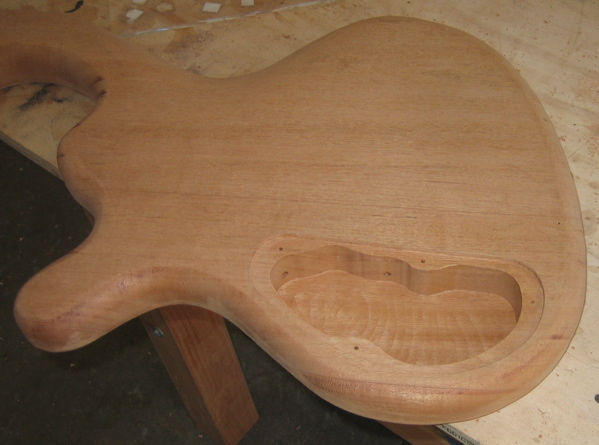 I got the neck pocket routed perfectly that I can pick the neck up and the body stays with it. 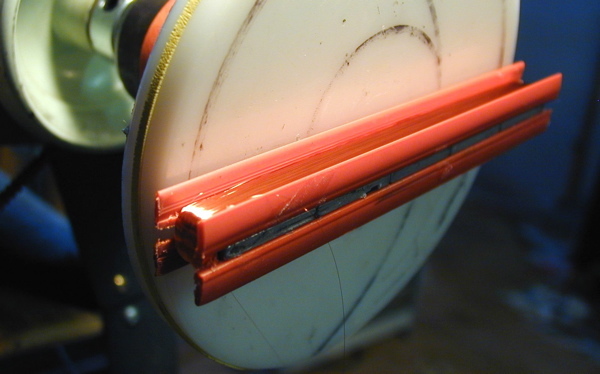 I also routed the pickup cavities. I wasn’t happy with how the Quilted Maple bookmatched together, so I added a small Ebony inlay between the boards. It will look really nice once the finish is on. Here is the control cavity routed and the little lip for the cover. I think I am going to add an external battery box so changing the battery will be easier. This weekend I routed out the area for the battery box, made the control cavity cover and drilled the holes for the neck screws and gold ferrules. Yes I know it doesn’t look that great now, but when it is all black on back it will look great. 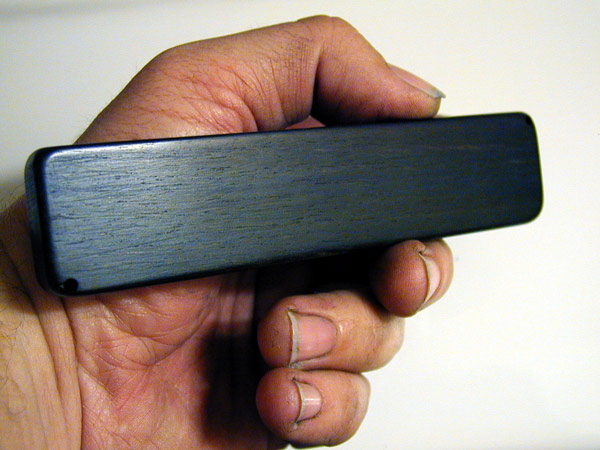 I went ahead and made a little lip on the edge of the fretboard for some Ebony binding. 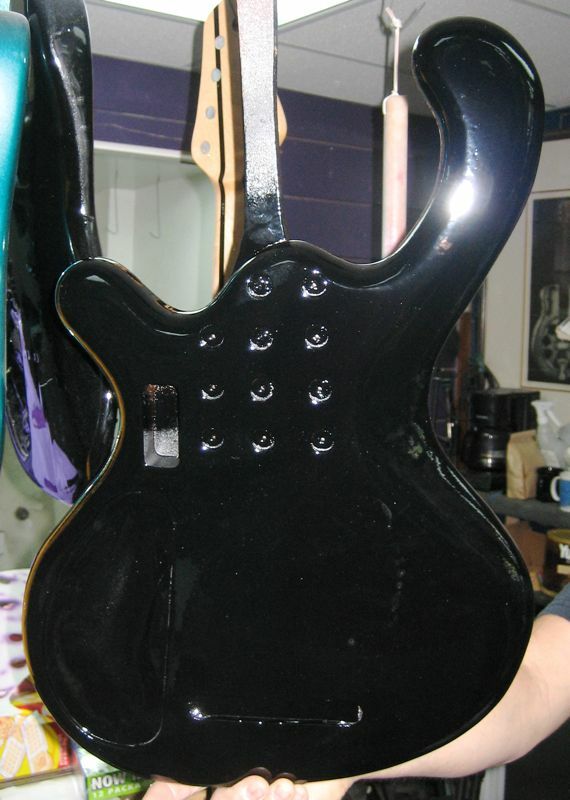 It will really bring the bass together and make the side dots more visible. 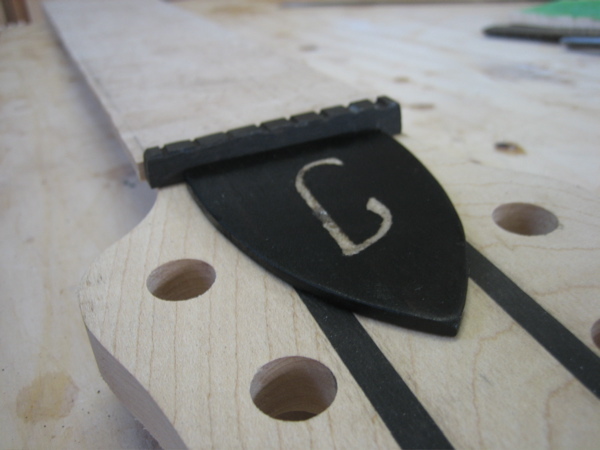 Lastly, I made the Greek letter “phi” as the 12th fret inlay. The epoxy didn’t have enough time to dry before I was done for the day, so it looks a tad bit sloppy. Once it dries I can sand it down and It will look great, especially with the Ebony binding to give it a border. Hipshot only sent me 7 bridges, so I was waiting on the 8th one. This is my first bass with gold hardware and I must say it looks good. I just need to route a cavity for them to fit in since Hipshot makes them like that. I didn’t have much time to work on the bass this weekend, actually only a few minutes. So I started sanding down the inlay to see what it looks like. In the picture it isn’t sanded down all the way, it will clean up and have more uniform edges. I glued the Ebony binding on the sides of the neck and let it dry. This weekend was just great. 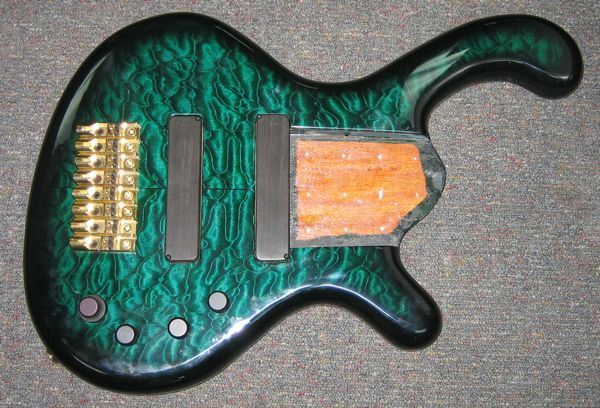 I got to dye the Quilted Maple body and see what it really looks like. I also put the side dot markers in and almost finished the 12th fret inlay. 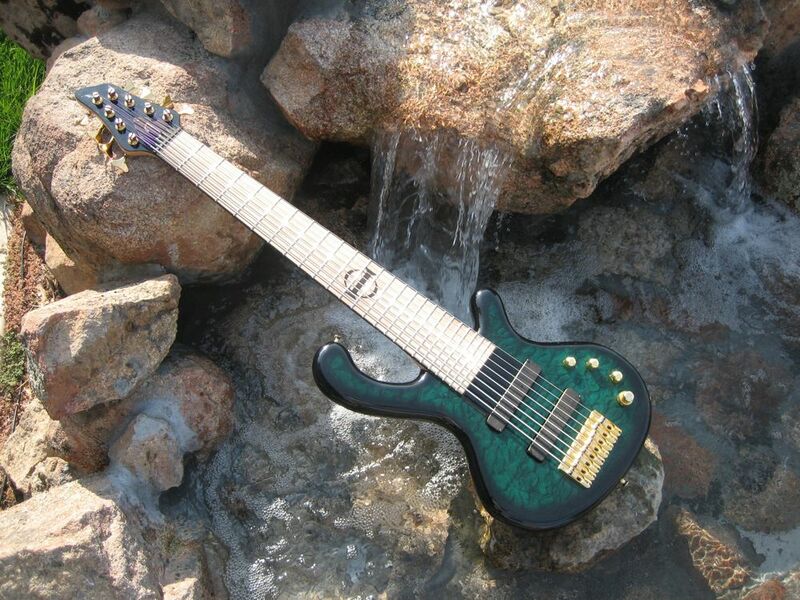 I just love this bass! I thought I would do a test fit of the parts to see how everything looked together. The body doesn’t look that great because it isn’t wet and the figure isn’t showing. 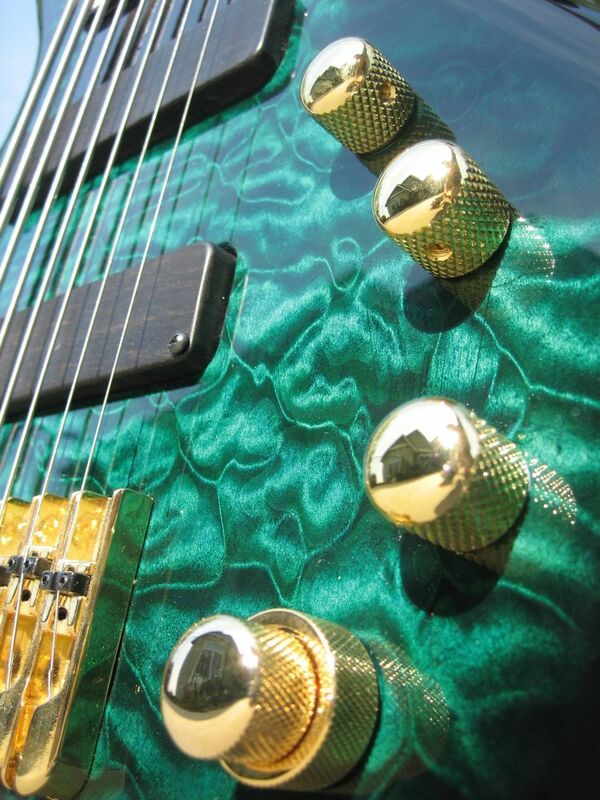 Here is the neck with the freshly hammered in frets. I still need to trim them and dress them properly. I just got the strings from Conklin today as well. Here is the .150″ low F#!! Again, not much to update here with the busy holdidays, but I thought I would put up some new pictures at least. I got this case the other day. 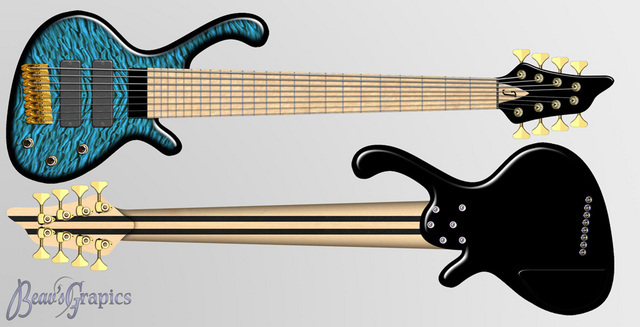 It is the only one I could find wide enough for this bass. It is actually pretty sturdy for a gigbag. 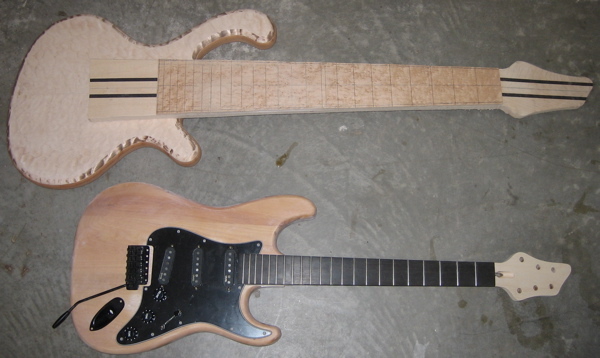 Here are some current pictures of it with and without strings. Yes I know the strings aren’t the right ones, they are just a couple old sets. Yes I know they aren’t on the tuners very good. The neck is totally done besides a nice wax job and the front being painted of course. Wow, sorry for the lack of updates again. The bass is officially out of my hands. Today I sent it off to the shop to have the finish put on, frets leveled, electronics installed as well as all the hardware. They said it would take about a month to do it, maybe more since they seemed really busy. So if all goes well it should be around the middle of March when this beast is done. Probably no new updates until then. 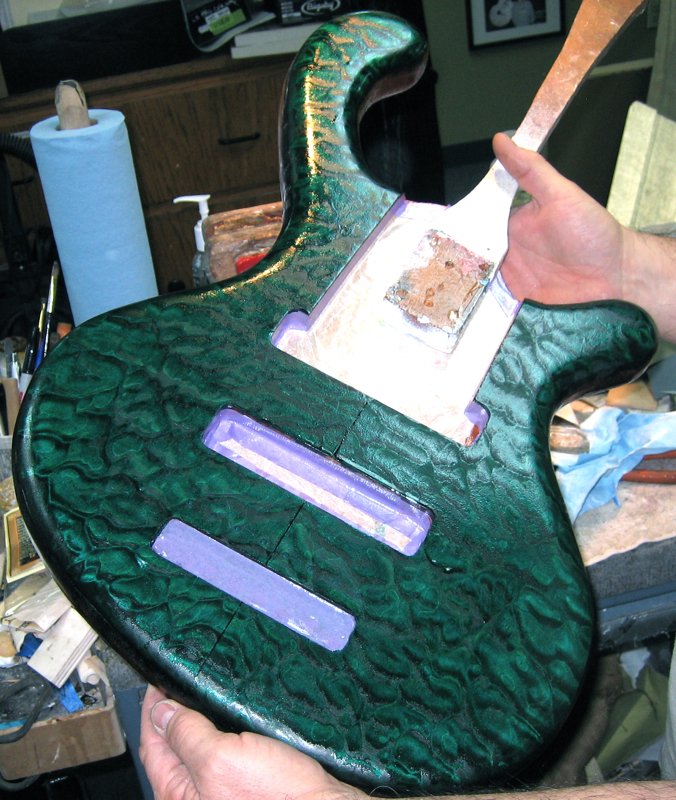 I went in to check out how the finish was coming along with the bass. They were still working on filling the grain on the body. It turned out a bit more green than I had hoped for, but part of that is due to the poor lighting in the picture. I didn’t take any pictures of the neck because it was all masked off and the headstock and heel were being painted black. With any luck it should be done towards the end of March is my guess. I got a call saying the shop had done the burst and that I need to check it out and give it my approval. I think it gets my approval just fine! Now it just needs a few clear coats and then they can move on to the fretwork and electronics. Here are just a few pictures I took today to hold you over. 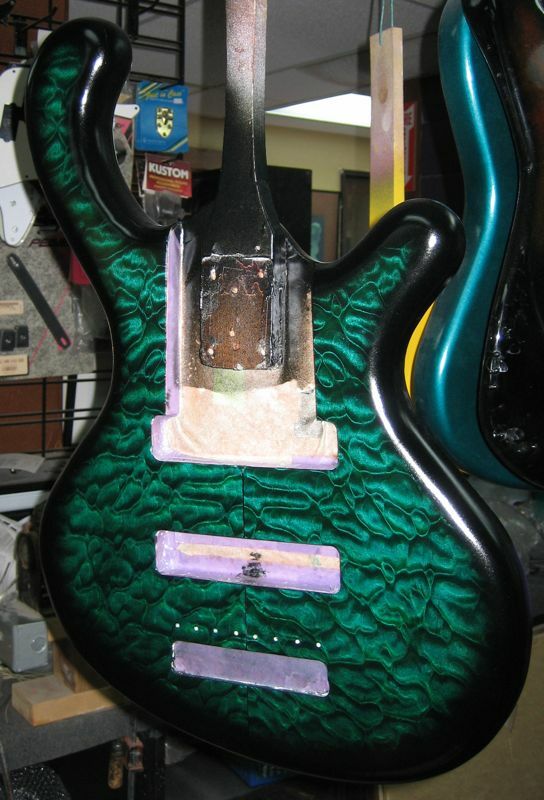 All that is left is some buffing of the finish and it will be like glass. Nothing real exciting on the neck, the back looks great though. Well it will be done from the shop on Monday. 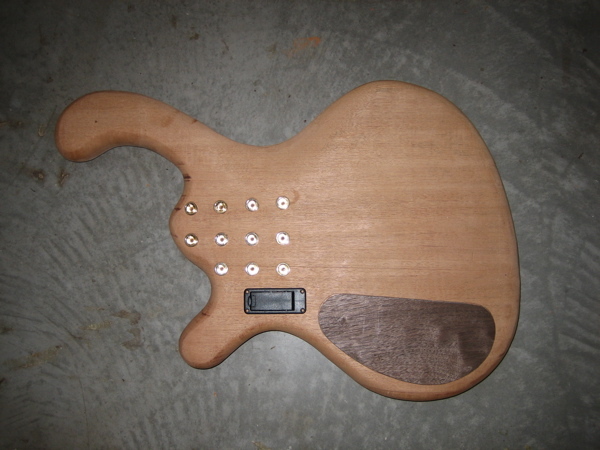 I took a quick picture of it as it stands, there will be gold knobs on it though.